In order to optimize sample traceability during clinical research processes, Micronic launches the 4.00ml tube with external thread. The 2D coded tube is designed to have a massive working volume of 3.40ml, while minimizing the height of the tube. The 4.00ml tube is ideal for centrifuging samples, due to its optimal sealing performance and external thread which eliminates the possibility of the sample coming into contact with the screw thread, greatly reducing the chance of cross-contamination while improving sample integrity. Furthermore, the high volume of the tube is also suitable for the storage of solid samples in for example agriculture and biodiversity research applications. The 4.00ml tube is Micronic’s latest addition to the range of new designs featuring an external thread. Due to the sturdy design and thick tube walls, made from medical approved Polypropylene, ultra-low temperature storage is possible. The triple thread of the tubes gives an excellent closure and horizontal placement of the cap to ensure long-term sample preservation and storage. The screw cap is available in six different colors to aid easy visual identification of stored samples. The 2D code of the 4.00ml tube is permanently laser-etched into the tube bottom, this means that the 2D code can be detached from the tube. Furthermore, the tube code surface has a raised edge to protect the 2D code against scratches. Due to a unique 2K injection molding technique, the black code surface cannot be separated from the transparent tube ensuring absolute traceability. Additionally, the 2D codes feature a human-readable code for secondary identification. The Micronic tubes are produced in certified class-7 clean rooms at facilities in both the Netherlands and the United States. The sample tubes are RNase/DNase and pyrogen free. 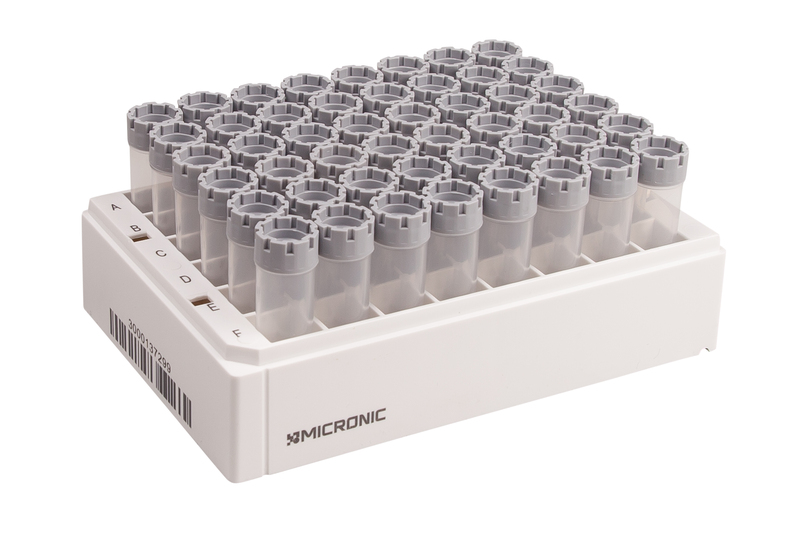 The Micronic ULT racks are also produced in-house. The 48-well format racks feature a laser etched 1D rack barcode on one side and a 'Twist-Lock' to prevent tubes from turning during screw capping or decapping. The Micronic ULT racks based on the automation friendly ANSI/SLAS rack format.